Walk where they walked, ride where they rode. The dramatic landscape surrounding the ranch was and in many ways still is the real wild west and our rides take you there. Ride by ancient Indian Petroglyphs, abandoned Railroad grades and trestles, forgotten mines and old prospector’s monuments. Whether you are an experienced rider or a complete beginner we have rides for everyone. In our herd we have horses for different levels of rider and we try hard to match guests to a horse that will make their vacation special. Children must be 5 years old to ride a horse and 8 to ride fast or on the “experienced rider” trails. Slow rides: For all levels of rider (walking only). 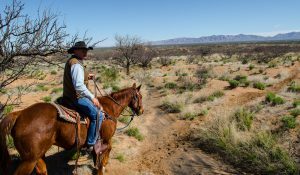 Exploring the Tombstone hills, the rides are scenic and cover a variety of terrains including sandy desert washes, abandoned railroad grade, old jeep trails and hills once mined for silver. Take in spectacular views of surrounding mountain ranges, Tombstone town and of the land where Apaches, cowboys and prospectors once rode. Fast Rides: For a more challenging riding adventure. 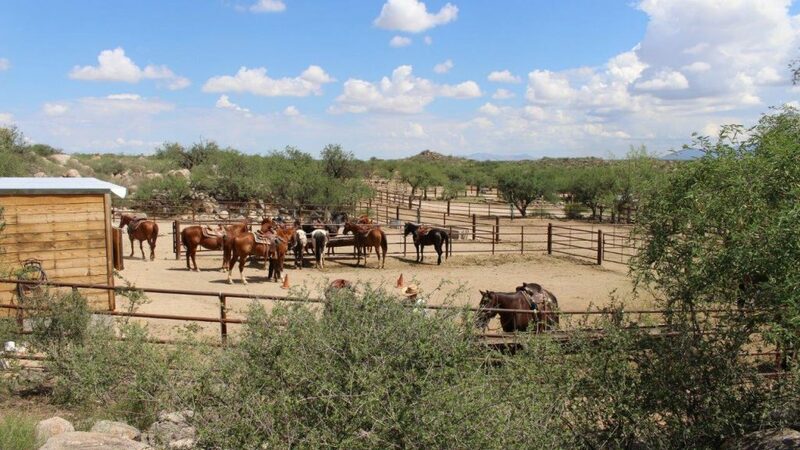 Walking, trotting and loping through the high desert terrain and a chance to really ride your horse. Trail to the 1800s: Our Wranglers take you back in time to visit local history. Petroglyphs, hand dug wells, mine shafts, rock cabin ruins, abandoned railroad trestles and the hidden valley are just some of the places to ride by. Ride to Tombstone: Ride to town just like Wyatt Earp and the gunslingers of the past. 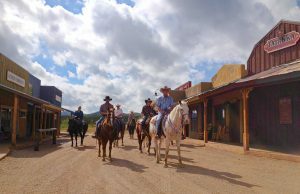 Through old ranches and along washes, step off your horse in an old Bull Riding arena and head to Allen street for an opportunity to look around the town, take in the sights, do a little Western shopping or have a beer at Big Nose Kate’s. Mount up and ride back to the ranch down Schieffelin Monument road. 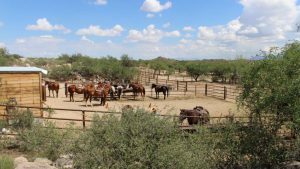 Beer and Cheetos ride: Wash away the dust with a cold refreshing beer, taste some empty calorie snack foods and share stories with good company, in the Arizona desert. Tequila Taster: Raise a red solo shot cup to your favorite western hero all while sitting on your horse on the desert trail. 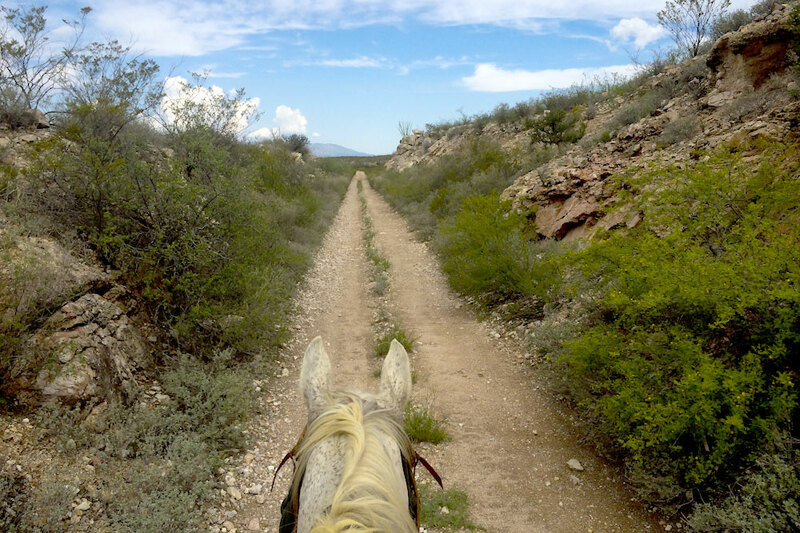 Half Day ride: This ride takes guests on an adventure in the Tombstone Hills. With breathtaking views of the Huachuca Mountains and many prospectors monuments and abandoned mines to spot this ride covers beautiful country. Team Penning: Try your hand at moving cattle in the arena! Obstacle Course: You and your horse work together to perform different activities, crossing a bridge, going over logs, opening and closing a gate, and even getting the mail.